Some fasteners can choose to be stubborn and in the process, make our task even harder. It is at such a time that you wish you had a better and more useful tool – we all do, one or another. Using ratchets can also take a significant amount of time to remove the bolts manually. Time moves slowly when you are doing a tedious task, and saps energy from you. You become demotivated, and your technical efficiency may diminish. However, the best air ratchets have sufficient power to deal with the most stubborn of fasteners so that you are left with the more important tasks of fixing the machinery or any other DIY. 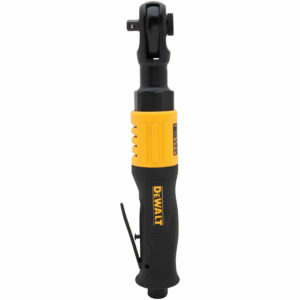 A decent quality air ratchet like DEWALT DWMT70776L is one of the good tools to have in your toolbox. Dewalt is no stranger in the world of power tools. They are the description of what efficiency blended in a power tool, is all about. As such, they have a large following where most people never dare to look elsewhere for devices. And true to the faith consumers have on them, Dewalt does not disappoint in this air ratchet. It is among the top budget air ratchets, worth every coin you invest in it. The ratchet packs some good punches when dealing with bolts and nuts, especially those that think they have a right to stay in the equipment for eternity. Talking about power, the DWMT70776L is a special breed. It comes with a decent torque of 65 ft-lb. It is more potent than most other ratchets that manufacturers try so hard to convince you to purchase. The ratchet is typically among the best in its class. It has a soft trigger that makes the operation so easy. As such, you have optimal control over the power delivered to the nut or bolt. It boasts a speed of 160 RPM, decent to hasten the fastening process. You do not need to waste your time on such trivial tasks while there’s so much waiting for you. One shortcoming associated with battery-powered ratchets is the inconsistent power supply. As such, you may need to keep charging the equipment to complete a relatively big task of fastening. However, that is something that you will not have to worry about with an air tool. The ratchet provides consistent power to fasten and remove bolts. You don’t have to stop midway to recharge. For some people, the ratchet is a little bulkier than its counterparts, but still a decent size. It weighs only 3.6lbs, and you can bear it without a problem at all. Some applications like bolt fastening under the car require suitable quality machinery that is also lightweight and small. However, the ratchet needs to be connected to an air compressor since it is an air tool and which may interfere with its portability. The machine comes with an aluminum body making it durable and lightweight. It also gifts the ratchet a certain kind of attraction. The ratchet has an ergonomic handle with a comfortable blend of plastic and rubber. The machine comes with an excellent three-year manufacturer’s warranty, which is a good thing. It indicates the faith that manufacturers have on the equipment, and you can purchase it without a second thought. The price is also not so bad and will not leave your savings with a dent. like there are Ingersoll and Makita in the automobile world, Dewalt is a premium quality brand. That said, the manufacturer has a huge following and never disappoints to produce the best quality equipment. They also back their products with a good warranty. You will notice the ratchet is a little bulky, that is if you have experience with other ratchets. As such, it may feel a bit uncomfortable, but that is something you can leverage on its quality. Dewalt makes good quality devices, and the size may not be something to worry about too much. The latchet is not the best for tight spaces, but still decent equipment for most fastening applications. It is a bit louder than most other ratchets, and you may need to lubricate it often to reduce the amount of noise. There’s always comfort in purchasing reliable equipment, and Dewalt is at the top of the list when it comes to reliability. The air ratchet wrench is not only reliable, but also well made. It is relatively portable, and you can use it in most applications, without a problem. You can check also Ingersoll ratchet before buying this tool. However, the ratchet is a bit bulky compared with others, and it may limit access to tight spots. It is also loud, but that is something that may not bother you as long as it is getting the job done – what more would you be looking for?